Camerata Pacifica continues to break new ground with adventurous programming, top-notch musicians, and, on this occasion, a West Coast premiere. The first half of the concert shone the spotlight on artistic director Adrian Spence’s flute playing, and on the stellar violinists who joined the group for the evening, Tereza Stanislav and Agnes Gottschewski. The Nocturne and Scherzo by Arthur Foote is the kind of thing at which Camerata Pacifica excels-gorgeous, relatively unknown Romantic music. Spence took the lead on flute, joined by Stanislav, Gottschewski, Richard O’Neill on viola, and Ani Aznavoorian on cello. Next up was a trio by Philippe Gaubert called Pice Romantique featuring Spence, Aznavoorian, and Lera Auerbach on piano. There was a bit of good-natured teasing among the musicians before they settled in, with composer Auerbach preemptively stating that she did not write the piece, and Spence rejoining that she wanted to distance herself from what is merely “flute music.” Flute music or not, Pice Romantique was another haunting example of the richness of the 20th-century repertoire. The last item on the first half of the bill was the Impresiones de la Puna of Alberto Ginastera, and it brought the initial quintet back to the stage for another satisfying excursion, this time into the world of Argentine rhythms. 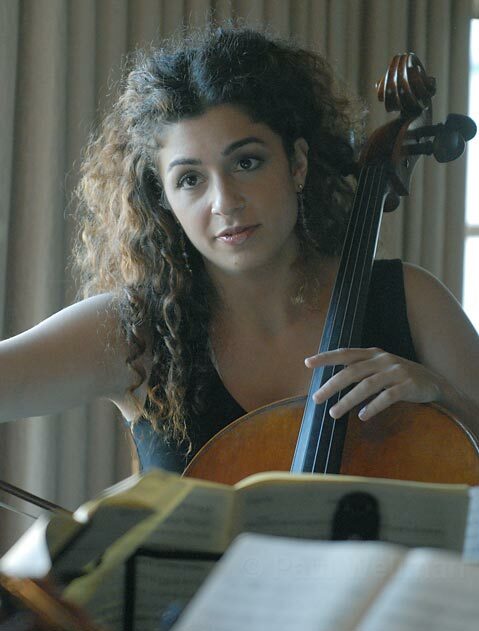 Ani Aznavoorian was featured in Lera Auerbach's <em>Twenty-four Preludes for Cello and Piano</em>. The entire second half of the concert was devoted to a single work, the Twenty-four Preludes for Cello and Piano, Op. 47 of Lera Auerbach. The composer spoke at some length about her process and about the extraordinary career of this particular composition, which has been reworked as a ballet score for choreographer John Neumeier of the Hamburg Ballet. In addition to being a pianist and a composer, Auerbach is also a very good poet, and her spoken introduction was carefully constructed to derive maximum impact from its conclusion, which was an appeal to the universality of music and memory. The piece itself was magnificent, thoroughly grounded in the Romantic tradition yet full of surprises and remarkable variations for the cello. Aznavoorian handled the wide range of extended bowing techniques with grace and assurance, often smiling broadly as she played as if in recognition of the generosity and sheer pleasure of the music. The exploration of the various keys was neatly complemented by an equally compelling exploration of dynamics that reached from the barest whispering harmonics to thundering chords and resounding melodies. The standing ovation that followed was well-deserved, and the audience walked away from this West Coast premiere with a revitalized faith in the future of classical composition.